Upper Deck’s 2013-14 NHL® O-Pee-Chee Wrapper Redemption Program has Sold Out! 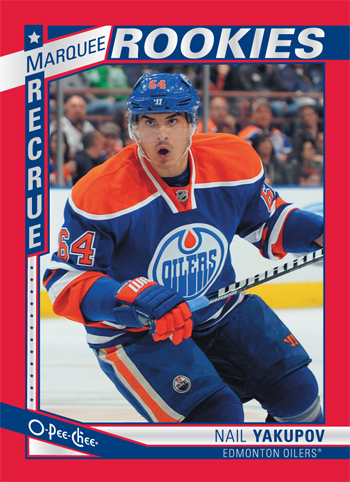 Upper Deck would like to thank our network of Certified Diamond Dealers and collectors throughout Canada for making the 2013-14 NHL® O-Pee-Chee wrapper redemption program in Canada such a great success over the last two years. Demand this year FAR exceeded our expectations, likely because of the buzz around the new rookie class with many key rookies appearing in the 2013-14 NHL O-Pee-Chee release. Upper Deck’s fulfillment center in Canada recently reported they have now depleted inventory on the 2013-14 NHL O-Pee-Chee wrapper redemption packs after receiving record numbers in this season. Fans in Canada sent in record numbers of wrappers this season to score cool red-bordered parallel cards like this one. Thanks to everyone who participated! As we initially reported when we announced this program, once the supply is depleted, the promotion is over. We want to thank everyone who sent wrappers in through their Certified Diamond Dealers and we hope you enjoyed the special red-bordered cards we created for you!